» More on JOHN T. McINTYRE, aka KERRY O’NEIL. More on JOHN T. McINTYRE, aka KERRY O’NEIL. As a brief introduction to this piece, I’ll begin by saying that mystery writer John T. McIntyre was the subject of a post you saw here last Saturday, albeit somewhat accidentally so: he was the author of �Blows in the Dark,� the lead story in Complete Detective Novel Magazine for November 1931. Thanks go first to Mike Grost for the comments he left after that percending post, during the course of which in part he reviewed Ashton-Kirk: Secret Agent. According to Mike, it starts out as a pure imitation of the Sherlock Holmes stories, then dissipates its early promise into becoming a cliched and routine espionage novel. Not a surprising report, I suppose, given the lack of name recognition that McIntyre has a writer today, but still a disappointing one. MacINTYRE, JOHN THOMAS. 1871-1951. 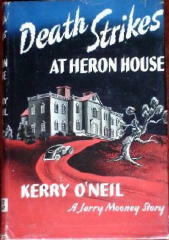 Pseudonym Kerry O�Neil, q.v. O�NEIL, KERRY. Pseudonym of John MacIntyre, 1871-1951, q.v. 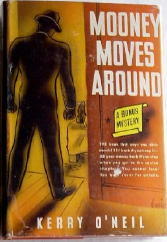 Mooney Moves Around (n.) Reynal 1939 [Jerry Mooney; Philadelphia, PA] �Private detective murder mystery surrounding the fashion industry.� NOTE: This novel was a SEALED Bonus Mystery. The last chapter of the book, containing the solution to the murder, was tightly sealed in a paper wraparound with printed bonus certificate. The reader would have to break the seal to finish the book. If unbroken, the book could be returned for a full refund; otherwise the purchaser could redeem the coupon for 35 cents. 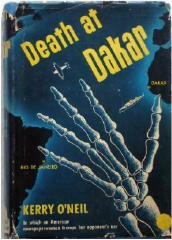 Death at Dakar (n.) Doubleday 1942 [Senegal] �In which an American newspaperwoman [Patricia Cornell] trumps her opponent�s ace.� Add to setting: Rio de Janeiro, Brazil. At the moment I don’t know much more about Jerry Mooney. He’s not included in Kevin Burton Smith online directory of private eyes, and what I do know (see above), I’ll pass along to him. Checking out the pulp fiction written by Kerry O�Neil, I�ve discovered a story written as by him in the October 10,1948, issue of Short Stories, a work called �A Short Shot at Purdy.�. Given that John McIntyre�s first entry in CFIV was In the Toils, a criminous play published by Penn in 1898, it certainly makes for a long if not entirely illustrious career. [UPDATE.] Later the same day. Google is wonderful. I�ve found a long, meaty profile of John McIntyre online here. It�s entitled �Noir Town: The hard life of John McIntyre, the legendary Philly novelist nobody’s heard of,� by Kevin Plunkett (2006). I�d love to reprint it here on the blog, but I�ll remain content to have you follow the link and read it for yourself. Highly recommended! �At his death, John McIntyre was already fading into obscurity. The intervening decades took care of the rest. Steve, you are right about Google. If you word the question the right way, it will give you the answer to just about anything. I clicked on the link to the profile of John T. McIntyre and was astonished to find such an excellent article about an unjustly forgotten author. In fact this City Paper article is so well done, I printed out a copy to put with my mystery and pulp reference books. I think your research on McIntyre is of great value and interest. Well done Steve!